1. Whip the cream and icing sugar together until it forms firm peaks. 2. 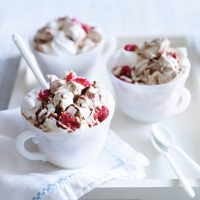 Stir the pots of ganache to soften the mixture slightly, then stir into the cream with the raspberries and meringues. Spoon into a large bowl and serve swiftly.